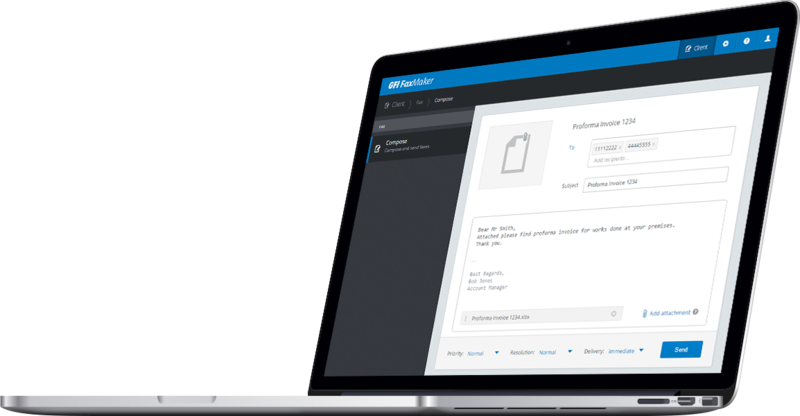 GFI FaxMaker integrates with your on-premise or cloud-based mail server, enabling users to send and receive faxes and SMS/text messages using their email client. You will save time, resources and lower the risk of confidential faxes being lost or read by unauthorized people. GFI FaxMaker also comes with feature-rich APIs for integration with other applications to support high volume and broadcast faxing. GFI FaxMaker provides enhanced data security by offering your organization a secure and auditable way to send and receive confidential faxes. Automatic inbound routing sends faxes directly to the recipient’s desktop or device, eliminating the risk of being discarded or read by an unintended recipient. Hybrid faxing means you can use GFI FaxMaker with select online fax services, giving you all the enterprise functionality of an on-premise fax server combined with the technical simplicity of cloud-based fax services: no phone lines, modems, fax boards or PABX integration needed. 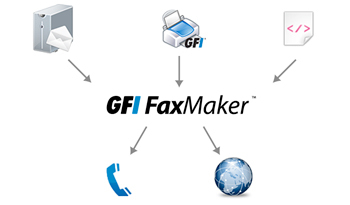 You simply need GFI FaxMaker, an account with a supported service and an Internet connection. Your administrators can quickly and easily search for archived faxes using the GFI FaxMaker archive viewer. An optical character recognition (OCR) module is also available to enable fast search and retrieval of fax and SMS messages from your email client or email archiving solutions. 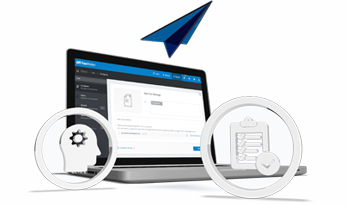 Integration with an archiving solution such as GFI Archiver™ will enable your company to back up, search and retrieve fax and SMS messages, maximizing efficiency and faster response times to eDiscovery or internal inquiries. Using GFI FaxMaker in a virtual environment, customers quickly benefit of drastically lower faxing TCO, helps with business continuity, enables you to consolidate hardware, reduces IT management and expenditure overheads and minimizes power consumption. You can easily send faxes over your IP infrastructure. GFI FaxMaker integrates with your existing IP-enabled PBX or T.38 capable VoIP service provider to offer FoIP without any additional hardware requirements. GFI FaxMaker’s FoIP may also be used to implement least cost routing (LCR); resulting in a cost-effective reduction in international calls dialed (calls are translated into a local call rate). A medium that enables sending and receiving of faxes: A supported professional fax board or fax modem class 2, 2.0 or 2.1 (click here), SR140 or XCAPI for FoIP, or a subscription to a supported online fax service. Internet Explorer: Required for HTML cover pages. As technology continues to advance, healthcare professionals are making significant strides in medicine, and expanding the scope of studies related to human health and lifecol-md-. Yet, among physicians and administrators – the fax machine – a decades-old dinosaur, remains a primary means of communication. Once considered a luxury, the mobile phone is now a necessity for daily, hourly and minute-by-minute communication. This is particularly true for healthcare professionals. Many of them, like the patients they treat, keep on-the-go schedules that place the landline phone somewhere between inconvenient and obsolete. Virtualizing a fax server has many benefits for companies and IT staff. GFI FaxMaker capitalizes on this capability to allow an all-virtual fax solution for both sending and receiving on a virtual and IP-based network structure. Along with this, GFI FaxMaker also allows for several methods of sending and receiving faxes to and from end-users. 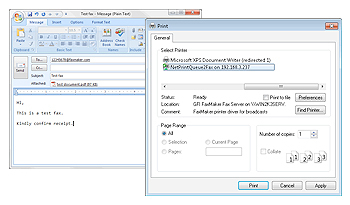 End-users can send faxes directly from a mail client such as Outlook just like they would send an email. Understanding how faxing in a virtual environment actually works is extremely important when considering your deployment strategy, how best to implement it and the components required. Many organizations looking at fax servers consider a hardware appliance to be the easiest way to go. Without research and investigation, this seems to be a good conclusion but when you weigh the pros and cons this is not the case. A virtualized fax server may be a much better choice.